If you ask Rudra Persaud, he will tell you about his parents who emigrated from Guyana to the Bronx when he was four years old and worked long hours to give him a better life, and his older brother, who is his role model. Rudra will also tell you about Breakthrough New York, how we stepped in to give him resources his parents couldn’t afford, and social and academic skills he couldn't otherwise get, all to propel him forward with a first-class education. We have become his family too, he says. Today, with vital services for vulnerable Americans under threat, young people like Rudra need family—in all its forms—more than ever. By supporting BTNY, you will send a powerful message to low-income kids that they deserve an opportunity to pursue their dreams. Families inspire. Families support. Families lift up their own. 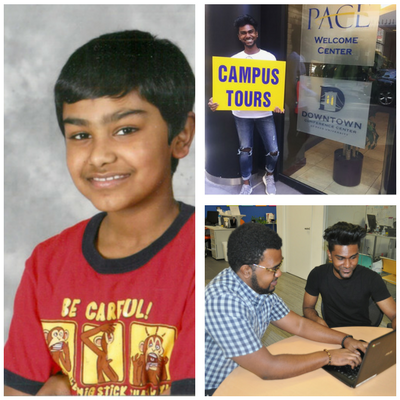 “What Breakthrough does for me is life-changing,” says Rudra, now a junior at Pace University. Following in his brother’s footsteps, Rudra was accepted to BTNY in 2009 as an eleven year-old sixth grader. That summer, he left the Bronx by himself for the first time, commuting two hours a day to our academic program in Manhattan. He was invigorated by our challenging curriculum and inspired by his hard-working peers. “I knew right away this was where I wanted to be,” he recalls. You can create breakthrough moments for hundreds of students like Rudra. Because of the generosity of people like you, each BTNY student has a breakthrough moment that changes his or her life forever. Rudra’s breakthrough came when our staff helped him get into a boarding school in Connecticut—and persuaded his parents to let him go. Today, Rudra is thriving in his junior year at Pace University. A bio-chemistry major, he is vice-president of a biology honor society, a member of several science clubs, and is plotting his path to medical school. And, he still finds time to serve as a mentor to our high school students on weekends. “Every kid deserves access to a community and mentors who care, like those at Breakthrough,” he says. You can help our students achieve their dreams. Your gift will provide students, like Rudra, with academic enrichment, tutoring, mentoring, test prep, high school and college admissions guidance, financial aid counseling, internship placement—and a place in our family, for life. Over the last 12 years, I have had the privilege of welcoming hundreds of amazing young people into our family. I have watched their breakthrough moments, when they master new skills, find a community of likeminded souls, and embrace a brighter future for themselves, and their families. I want to thank you deeply for your ongoing generosity. You, too, are part of our family, and I will forever be grateful. p.s. As you know, I am stepping down as executive director at the end of 2017, but with your help, the BTNY family will be here for our students, today, and for many years to come.